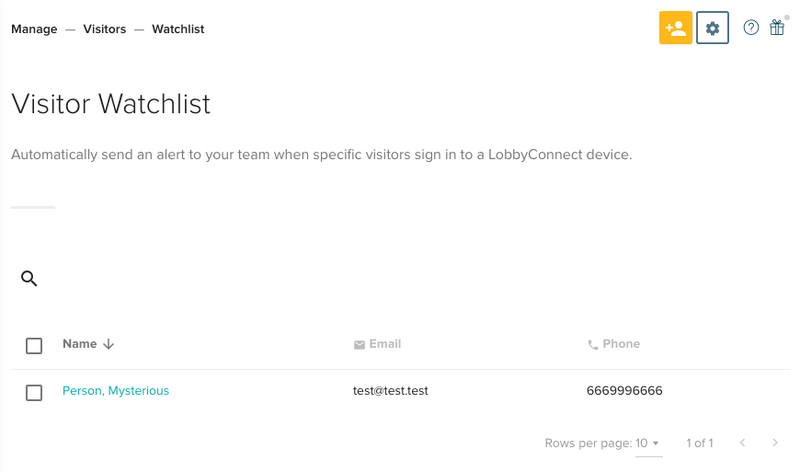 When a visitor checks in, LobbyConnect 2.0 can send a few types of notifications to the host via SMS, email, or chat. If the visitor is on the Visitor Watchlist (often used for security or VIP purposes), LobbyConnect 2.0 will notify the owner of the Visitor Watchlist. 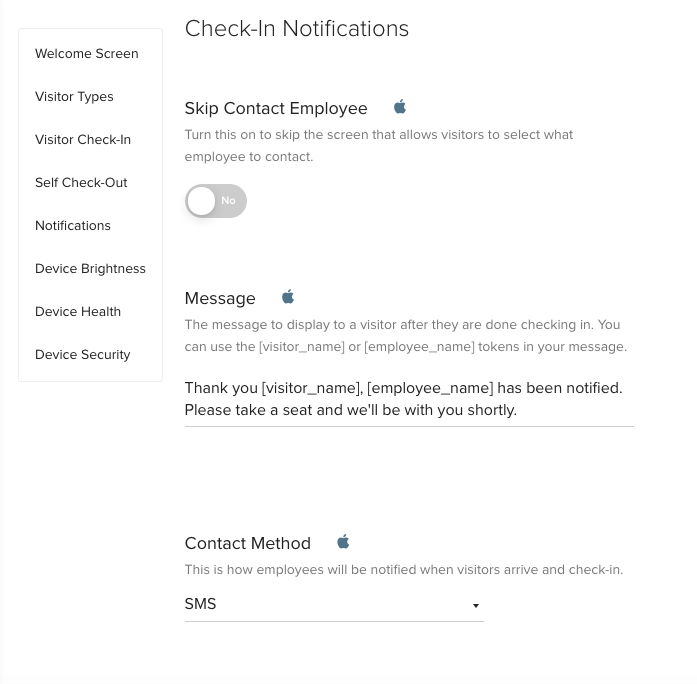 LobbyConnect 2.0 has several methods of notifying employees when their visitors arrive. We offer either SMS message notifications or email notifications (both cannot be used simultaneously). We also offer integrations with chat platforms, Slack and HipChat, which can be used in conjunction with either SMS or email notifications. This article will describe the setup process for SMS and email notifications. To learn more about the Slack integration, click here. To learn more about the HipChat integration, click here. 1. Sign in to the Teem admin dashboard. 3. Then under Manage, select Apps & Integrations. 5. Scroll down to the section labeled Check-in Notifications. Under this section, you will want to make sure Skip Contact Employee is toggled to No. 6. The Contact Method section is where you will choose between SMS and email. If you select SMS messaging, the employee who has been contacted as the host has the option of messaging back and forth with the visitor (email does not have this option). 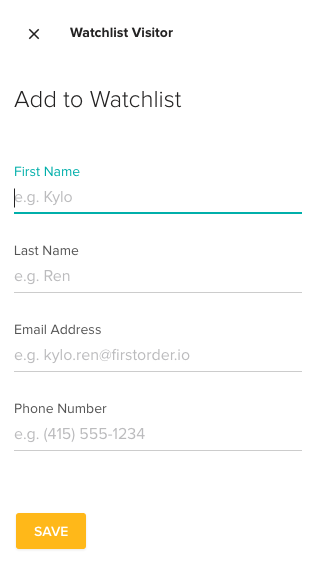 When messaging back and forth, both parties’ phone numbers are anonymized for privacy (we use Twilio for our SMS option). Note: Employees are contacted using the info (phone number or email) associated with their email contact card (in Google or Exchange or Office 365). If the phone number is blank, we will send an email as an alternative method of contact, given that the email is provided to us. Similarly, if email is selected and we do not have a valid email, we will then try to send an SMS message. Once you’ve set the Contact Employee toggle and selected a notification from the Contact Method section, you’re all set. The next time a visitor selects their host when checking in using LobbyConnect 2.0, that host will be notified in the manner you’ve designated. Tip: Occasionally our customers like to have another employee, besides the host, be notified when particular people check in with LobbyConnect 2.0. That’s why we have Visitor Watchlist. Keep reading to learn more. 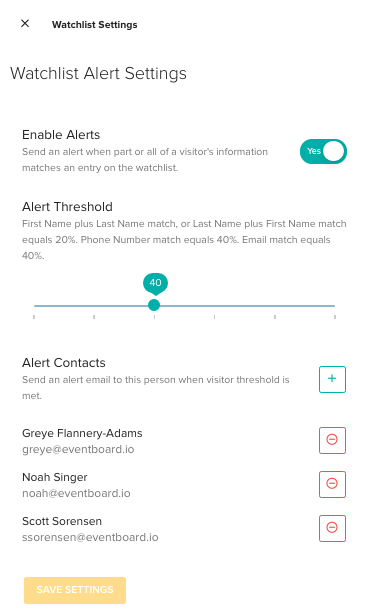 With our Visitor Watchlist feature, the employee that you designate to receive the alert – such as the building's security manager – will get an email whenever anyone who meets certain criteria uses LobbyConnect 2.0 to check in. In addition to improving security, it allows you to have better overall awareness of who is entering your space. From there, you set a threshold of what percent of your criteria must match the fields the visitor completes during checkin to trigger the Watchlist alert. For example, if you select 50%, then two of the four criteria must match what the visitor fills in on LobbyConnect 2.0 at check-in. Note: The contact alerted when people from the Watchlist check in is global, it can’t be set on a per-visitor basis. In this example, we create a Watchlist entry for a news reporter who we know will be visiting for an interview with the Head of IT. Because our company doesn't want a reporter wandering around the office unescorted, someone in security needs to be alerted when she arrives so she can be escorted to wherever the interview is taking place. Other use cases could include former employees, foreign dignitaries, and your friendly mother-in-law. 1. Log in to teem.com. 2. Click Manage in the left menu. 3. Click Visitors from the anchor menu on the left side of your screen. 4. In the Visitors section, go to the tab labeled Watchlist. This Watchlist tab will display a list of all the people you'd like to "be on the lookout" for. 5. To add an entry, click the yellow ( + ) button in the top right hand corner. This will open a sidebar for entering the details for the person who's going on the Watchlist. All of the fields must be filled out. 7. The next step is to select who within your company should be alerted when any of the people on the Watchlist, such as the news reporter, check in using LobbyConnect 2.0. Click the gear icon next to the ( + ) Add button. This will pull up a Watchlist Alert Settings menu. 8. In this menu, click the blue ( + ) sign next to Alert Contacts. Fill in their name, email address, and phone number. 9. Click Add Contact. 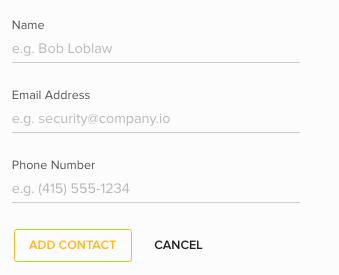 You can add multiple security contacts – everyone you add will receive the email when an alert is triggered. This sidebar is also where to set the Alert Threshold. This has to do with the percent match between the information entered at the LobbyConnect 2.0 display by the person who's on the Watchlist and the information you entered for that person when you added them to the Watchlist. First Name plus Last Name match, or Last Name plus First Name match equals 20%. Phone Number match equals 40%. Email match equals 40%. Now that the above steps are completed, when the reporter (or any contact on the Watchlist) checks in, the security contacts will receive an email like the one below.